This document lists specifications for the SWB-2812A/B matrix relay card. All specifications are subject to change without notice. Visit ni.com/manuals for the most current specifications. Refer to the NI Switches Help for detailed topology information. Specifications characterize the warranted performance of the instrument under the stated operating conditions. This module is rated for Measurement Category I and intended to carry signal voltages no greater than 100 Vrms/150 Vpk/150 VDC. This module can withstand up to 800 V impulse voltage. Do not use this module for connection to signals or for measurements within Categories II, III, or IV. Do not connect to MAINS supply circuits (for example, wall outlets) of 115 VAC or 230 VAC. Refer to the Read Me First: Safety and Electromagnetic Compatibility document for more information on measurement categories. Measurement Categories CAT I and CAT O are equivalent. These test and measurement circuits are not intended for direct connection to the MAINs building installations of Measurement Categories CAT II, CAT III, or CAT IV. In systems that include cards with different maximum voltages, the lowest safety voltage rating as specified on the front of the card applies for the entire system. The system can include all cards in the carrier, and all cards in other carriers that are connected with the NI 2806 expansion bridge. Refer to the Read Me First: Safety and Electromagnetic Compatibility document for important safety and electromagnetic compatibility information. To obtain a copy of this document online, visit ni.com/manuals, and search for the document title. To ensure the specified EMC performance, operate this product only with shielded cables and accessories. The protection provided by the SWB-2812A/B can be impaired if it is used in a manner not described in this document. Always disconnect or turn off power sources before powering on a chassis. DC path resistance typically remains low for the life of the relay. At the end of relay life, the path resistance rises rapidly above the specified value. Load ratings apply to relays used within the specification before the end of relay life. Optional 100 Ω series protection resistance, available for the interface cable, increases the expected relay life at higher voltages by protecting the reed relays from the effects of cable and load capacitance. For more information about increasing the life of your relay, visit ni.com/info and enter the Info Code relaylifetime. Reed relays are highly susceptible to damage caused by switching capacitive and inductive loads. Capacitive loads can cause high inrush currents, and inductive loads can cause high flyback voltages. The addition of appropriate protection can greatly improve contact lifetime. For more information about adding protection circuitry to a capacitive load, visit ni.com/info and enter the Info Code relaylifetime. For information about inductive loads, enter the Info Code relayflyback. Certain applications may require additional time for proper settling. Refer to the NI Switches Help for information about including additional settling time. For topology-specific connection information, refer to your device in the NI Switches Help and the installation instructions for any associated accessories or terminal blocks. The following figure shows the reed relay lifetime nomograph. The purpose of this graph is to estimate reed relay lifetime. This nomograph is not meant to be an exact or guaranteed specification and should only be used as a guideline to estimate lifetime. Actual reed relay lifetimes may vary, depending on application. Determine the peak voltage experienced across the relay while switching and mark this value on the Volts line. Determine the sum of the DUT, cable, and instrumentation capacitances and mark this value on the Load Capacitance line. Draw a straight line between both values. 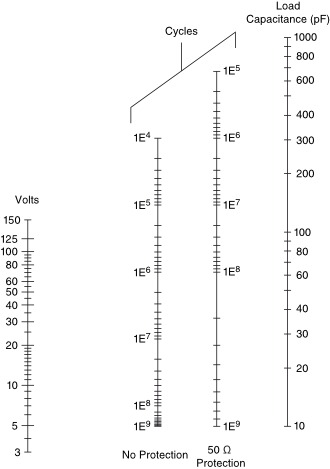 The intersection points of this line and the No Protection and 50 Ω Protection axes are the corresponding estimated relay lifetimes in cycles. For more information on adding protection resistance, visit ni.com/info and enter the Info Code relaylifetime. The reed relay module is connected to a DMM through 1 meter of cable. The DMM and cable capacitances are 100 pF and 30 pF respectively. The maximum voltage switched across the relay is 50 V. Determine the estimated number of relay cycles with and without protection resistance. The total load capacitance is the sum of the cable and DMM capacitance, which is 130 pF. Draw a line between the 50 V point on the Volts axis and 130 pF on the Load Capacitance axis. The line drawn intersects the Cycles axes at approximately 500,000 on the No Protection axis and about 25,000,000 on the 50 Ω Protection axis (refer to the following figure). This series resistance should be placed as close as possible to the relay for maximum effect. To obtain product certifications and the DoC for this product, visit ni.com/certification, search by model number or product line, and click the appropriate link in the Certification column. NI is committed to designing and manufacturing products in an environmentally responsible manner. NI recognizes that eliminating certain hazardous substances from our products is beneficial not only to the environment but also to NI customers. At the end of the product life cycle, all products must be sent to a WEEE recycling center. For more information about WEEE recycling centers, National Instruments WEEE initiatives, and compliance with WEEE Directive 2002/96/EC on Waste Electrical and Electronic Equipment, visit ni.com/environment/weee.htm. Refer to ni.com for more information about the following accessories. Use only NI cables. Cables with metal connectors might expose the user to hazardous voltages. To ensure the specified EMC performance, operate this product only with shielded cables and accessories. Do not use unshielded cables or accessories unless they are installed in a shielded enclosure with properly designed and shielded input/output ports and are connected to the NI product using a shielded cable. If unshielded cables or accessories are not properly installed and shielded, the EMC specifications for the product are no longer guaranteed. 1 The overall carrier drive limit prevents simultaneous drive of relays under the card limit on some cards in some configurations. Refer to the NI 2800 Specifications for information about carrier drive limit. 2 Relay operate and release times depend on PC and PXI bus performance and application software. For more information about NI SwitchBlock relay operate times, visit ni.com/info and enter the Info Code exa9ee. 3 For more information about NI SwitchBlock power limits, visit ni.com/info and enter the Info Code sbpwrlim.